The Community Coin Challenge sponsored by the Lakes Region Chamber of Commerce culminated with the third annual Octoberfest, held in the Buck’s Naked BBQ parking lot in Windham on Saturday, October 18th. 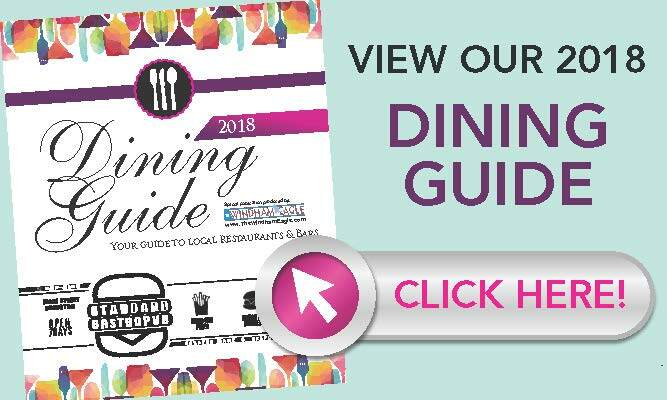 This year’s event was the biggest yet with more vendors, more attendees, and more donations to support ten food pantries in the Lakes Region. All festival events were free, with donations accepted, to ensure that anyone in the region would be able to attend. Attendance at Octoberfest grew this year by 15 to 20 percent, said organizer Sheri Huff. There were 16 additional things to do as well, she said. The ultimate goal each year, said Huff, is to have the amount of donations collected rise. As of Saturday, the donations had reached over $17,000, and that was before counting donations received at Octoberfest. A final amount of funds raised was not available before press time. Octoberfest offered a great range of events, including a pumpkin carving contest, costume contest, cupcake eating contest, children’s games, a mini vehicles parade by the Kora Shrine Log Rollers, chair massages, pumpkin decorating, crafts, bobbing for apples and a very popular dunk tank. There was a wide variety of food to be found, from hot dogs and sausage sandwiches, pizza and subway sandwiches to sweet treats like whoopie pies, caramel apples, cookies and cotton candy. A horse drawn wagon circled the parking lot and a trail out in back, and helicopter rides were offered for $35 per person. Children in costume darted excitedly from booth to booth with adults in tow, enjoying the games and two bounce houses and dancing along to the musical entertainment provided by Montgomery Road and deBreeze and Keys. Jen Berry from Naples learned about the festival from her mother. Berry brought her son and a friend after their morning soccer game, and said they were having a great time. “It’s a great way to raise money and have the community come together,” she said. Christine Stanford, president of the Community Resource Council in Naples was manning the Naples Food Pantry booth. She said the event is all about exposure and educating the community as to what resources exist. “It’s really wonderful to have everyone here together,” she said. And every penny raised counts, she added, stating that 16 cents buys a pound of food at the Good Shepherd Food Bank. “You don’t realize how many people you are helping out when you do this,” she said. Teresa Springer, a cotton candy vendor at the event, said that the sense of community at the event was great, and is what the event is all about. There is a sense of need in the region that is almost palpable, she said, which is why an event like Octoberfest is so important. “Here, it doesn’t matter what green is in your wallet. It’s about a sense of community and being together,” she said. Huff said the growth of the event has been great, and the support from the community – both businesses and people coming out to participate, has also been wonderful. She wanted to thank the businesses involved for all the support they give, from the coin challenge to setting up booths with free events, for such a good cause. Donations in 2012 and 2013 combined totaled $38,039.28. With this year’s tally already over $15,000 without including Octoberfest donations, the chamber’s goal of creating a larger, more successful event each year has been soundly met. The Raymond Village Library, under the direction of librarian and library director Sally Holt, is busting at the seams with books for all ages, computers, study areas and even a telescope. “Books are very personal. They can teach you something,” said Holt. “The library is a place people love.” However, libraries are changing and with it librarians have to adapt to be librarians in the library, on the Internet and out of the library. Raymond Village Library (RVL) has increased membership, circulation and patron visits over the last year, Holt said. “In fact, everything is up.” Adult programs take place most Wednesday nights range from author chats to adult education programs. Last year there were 33 programs and attendance was at 599 people. “This is a wonderful launching pad for new authors. The oral tradition talks about who we are and helps to build a closer relationship with the town,” said Holt. Children’s programs like story time happened 90 times with 2,395 children attending. The library has been in existence since the early 1900s but it looked a lot different. “Books were placed "in the parlors of Mrs. Atwood Tukey, Mrs. Lulu Burdge and Mrs. Andrew Leavitt, in Mrs. John Hayden's stable, Albert Plummer's front hall, and in one of the entries of the Village Church," according to the late Eleanor Plummer, one of the founding members of the Raymond Woman's Club, who organized the library. Today’s library on Route 121 was built in 1969 and was financed entirely by fundraisers the Woman’s Club held. In 1979, the children’s room was added and dedicated to Eleanor Plummer. In 1984 the name was changed to Raymond Woman's Library Club. In 1995 this was further changed to reflect the interest and assistance from the men of the community, and became the Raymond Library Club. In 1996, the library voted again to change the organization's name, this time to the Raymond Village Library Club and hired their first library director. Also in 2001, due to the remarkable success of the children's programs, we hired a second staff member, the youth services coordinator, said Holt. In October 2003, more changes came to the library, changing its structure to an incorporated non-profit organization. The library is now overseen by a board of trustees, plus one selectperson from the Town of Raymond who serves as an ex-officio member. The board sets policy for the library and is responsible for maintaining funding for operations. Librarians are well trained professionals who know how to help the people who walk in the door, from a dad and daughter looking for monster books to children who are looking for chapter books. “I try to find what they want or something you know about that will enhance what they’re doing,” said Holt, who has a Master’s degree of library sciences from Clarion University and a BS in secondary education. Holt’s favorite genre is biographies, but she is also a fan of magazines, of which the library subscribes to 20 different ones. She also reads newspapers. 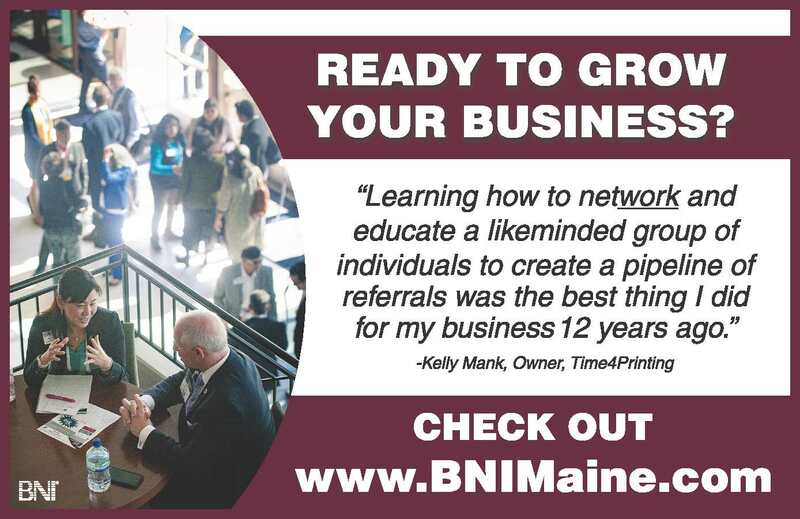 “It helps me talk to people about many things and give me a broad range of what’s going on in many areas.” She calls this “incidental knowledge” where she can connect with patrons and be on level ground. It’s one way she provides great, caring customer service. Volunteers are the lifeblood of RVL. Although they cannot do the work of the paid staff, they help with shelving books and helping Holt in other library duties. “We have some excellent volunteers. Our publicity person has been helping for close to 20 years,” Holt said. The library was automated a year ago thanks to a grant. Most of Maine’s small libraries, almost one-third, are not automated. RVL has to earn through grants and fundraisers $50,000 to keep the doors open and the lights on each year. They have received money from businesses and groups like Gorham Savings Bank, Norway Savings Bank, Loon Echo Land Trust, PTO and Maine Romance Writers. Finding the money is an everyday struggle for Holt and on top of that she works to keep the library relevant to what her patrons want. She is planning a crochet and knitting needle library for people to check out the items they need for a project. She would also like to see a cake pan library. This past week, Legos arrived at RVL for a Lego club that has been started. With the addition of the new programs and the never ending demand for new books, publications and technology, RVL has run out of space. “We need a larger space, computer classes, teen activities and more activities for people to gather,” said Holt. “Where else in the country can go for no reason, stay the whole day and you don’t have to spend a penny.” The wi-fi is free and the volunteers are friendly. “It’s a super library and a super community. They need to do what they can to hold onto this library,” said Holt. Local businesses and residents are asked to help with the annual appeal that is currently going to meet the budgetary needs of the library. RVL does receive small grants and local businesses have been generous, said Holt. She added that the library does get some support from the town. One of the fundraisers RVL does is a Raymond Garden Tour 2015, where residents open their gardens for viewing to the public. “If they have (a library) they need to hold on to it. It’s the first and last place people go for information,” said Holt. Libraries around the area work together to keep current. They use the resources of the Maine State Library, which is looking out for them, Holt said. RVL just joined the interlibrary loan van service, which usually costs $800, but Holt was able to get the service through the Maine State Library. This increased the collection of RVL exponentially. “I don’t want people to leave feeling satisfied. I want them to leave feeling delighted,” she said. The "under construction" picture on the right is from 1996. This addition nearly doubled the library's space and was funded primarily by a capital campaign. 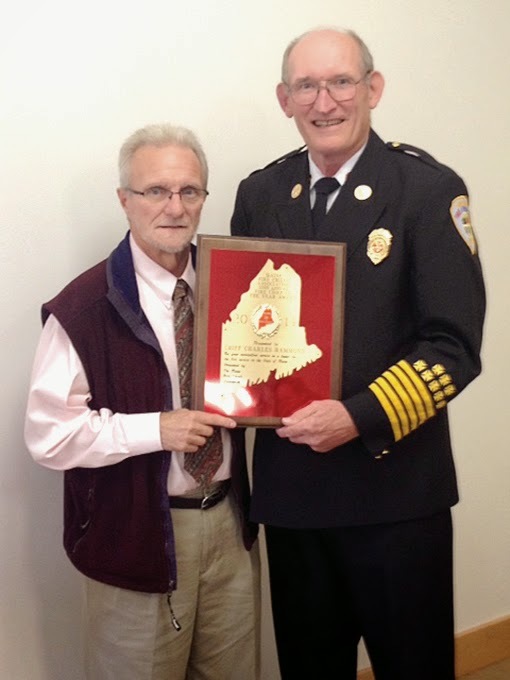 Windham’s Fire Chief Charlie Hammond was awarded the Maine Fire Chiefs Association’s 2014 Fire Chief of the Year Award at a banquet this month. The important awards are “people who come up to me at Hannaford to say, ‘you came to my house.’ Those are the things that mean the most,” said Hammond. Hammond was nominated by Town Manager Tony Plante. “I felt that the chief should be recognized for his contributions to the fire-rescue service not just in Windham but in our region, and for his lifetime of public service,” he said. “I don’t consider myself a fire chief any different from one from a small community,” Hammond said. “He has the same challenges and adventures we have, but on a smaller scale. Those are his tests. With us, ours is a transitional state. We’re moving the ball forward. 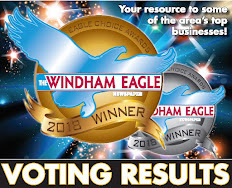 The town council allowed us to fund two people being in North Windham overnight.” This allows response times to be four minutes faster in some cases, providing medical care or fire suppression that much sooner. Chief Hammond has seen many changes since he started working in Windham as the fire chief, he said, especially the fire trucks, which are much more current now. The award was presented in Augusta at the Fire Chief’s Annual meeting. In attendance were Stanlee Emerson from WFD, Plante, councilman Dave Nadeau, assistant town manager/HR director Phyllis Moss, library director Jen Alvino, Hammond’s son, Andy, who is a Portland firefighter and area chiefs. Hammond will retire mid-January. The search process is underway for a new chief. “They pay me to do a job and I hope I do it to their satisfaction,” said Hammond. 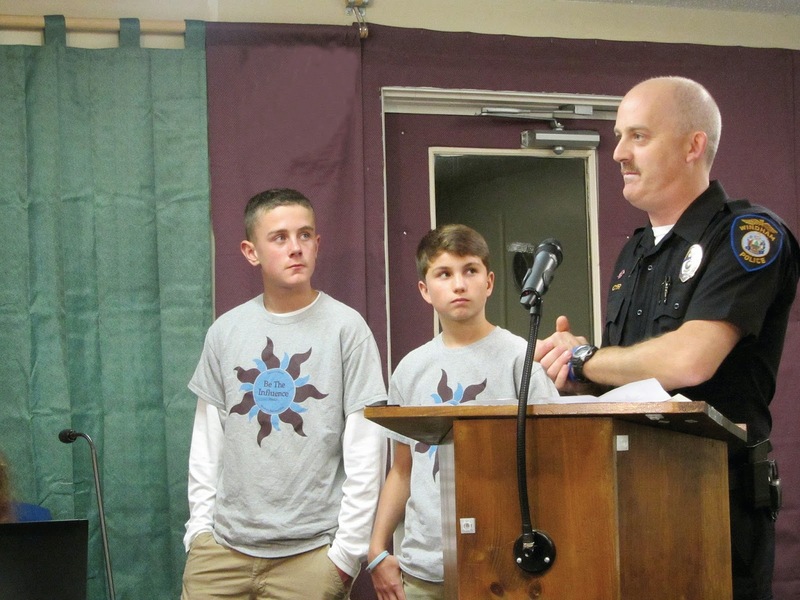 Tuesday night, Windham Police officer Matt Cyr and two eighth-grade students, Ashley Lewis and Griffin MacVane requested that the Town of Raymond sign a petition and join the Town of Windham, RSU14 School Board of Directors, the Windham Police Department, the Cumberland County Sheriff’s Office and the Sebago Lakes Region Chamber of Commerce, in the support of the “Be the Influence” campaign. The community wide crusade is to provide positive examples and information to keep teens away from drugs and alcohol. “We need to muster the community to be involved,” said Cyr. Cyr and the boys were joined by Windham High School assistant principal Kelli Deveaux and Jordan-Small Middle School and Raymond Elementary School guidance counselor LynnEve Davis as they explained that just having one group, the school for example, lecture the students about substance abuse isn’t good enough. They need to hear positive messages from every corner of the communities they live in. “We need federal funds to make this really big idea a really big success,” said Cyr, who has received the first grant of $60,000. The group was created with a lot of student input. The children didn’t want to be preached to. “Be the influence, decisions matter,” they told the group of adults gathered and the slogan was born. The middle school is the first time peers are more influential than parents and adults. However, what adults do in front of the teens is likely to have a direct impact over their choices, Davis told the Raymond Select Board. “Adults that think drinking is okay have teens that are two times as likely to drink,” said Davis. At the high school level, teens who have seen adults drunk or high in the last five years, are five times as likely to drink and four times as likely to use marijuana, she added. 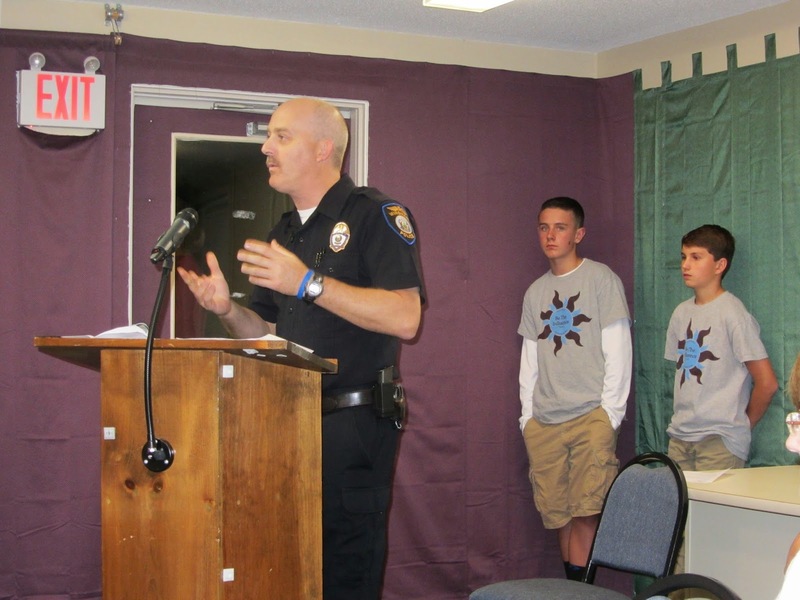 The program Be the Influence was created by the Be the Influence Collaborative whose membership includes RSU 14 school staff, Windham and Cumberland County Police officers, Town Managers, parents, local organizations, Chamber of Commerce, libraries, recreation departments, and community members. The campaign includes a website, www.BeTheInfluenceWRW.org, that offers information on preventing teens from using drugs and alcohol as well as supports available in the community for parents, community members and schools. The students, under the direction of Cyr, discuss being a leader and how not to follow people down the road of drugs and alcohol. “To be a leader is really to not go with the crowd. Leaders make an impact on the community. If you make a good decision the followers will follow you,” said MacVane. 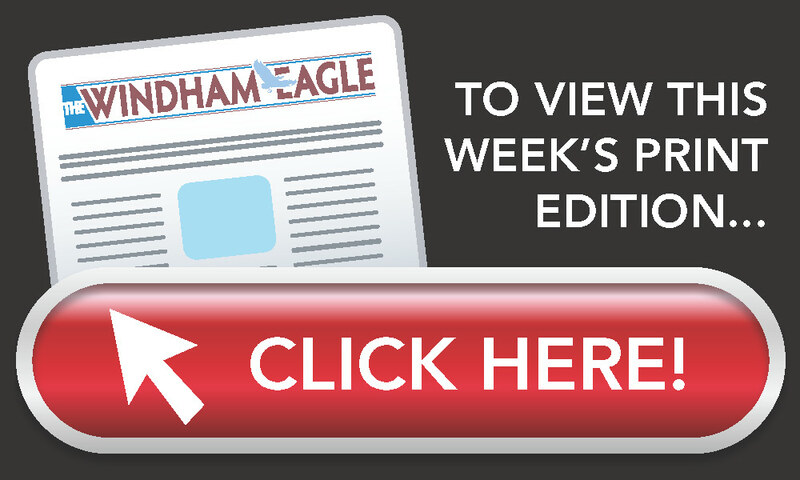 The Windham Council recently passed a resolution to support the campaign. The Raymond Select Board voted unanimously to sign the resolution and support the initiative.